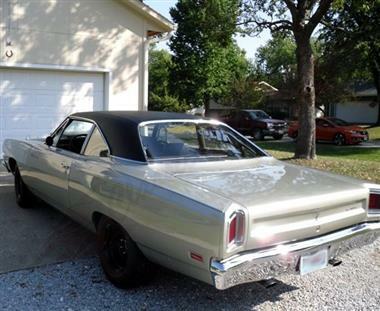 1969 PLYMOUTH Road Runner in Arlington, TX for sale. 1969 Plymouth Road Runner This beautiful 69 Plymouth Road Runner has been meticulously restored to its current condition as a A12 tribute. 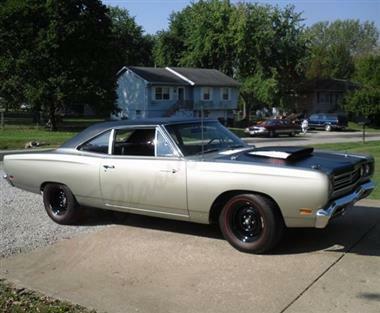 The car is really well done from front to rear and has the ultimate mopar look combined with great drivability. The body is very straight and all rust free. It is coated in a Silver Metallic color which combines perfectly with the Matte Black hood/scoop and Black vinyl top. The hood is fully removable by using the 4 strong hood lock pins holding it securely in place. The chrome bumpers, window stainless and grill all have a very nice shine with no pitting or issues. The headlights and taillights are all working properly and the glass is all in good shape as well. The car looks extremely tough rolling down the road and even sitting still has a very striking appearance. 15 inch Blacked out steel wheels sit under all four corners and are wrapped with Redline radial tires. 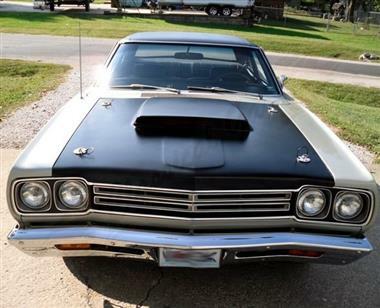 That advertisement on the hood scoop isnt just there for looks because powering this muscle car is a date correct M code 1969 440 V8 motor with 6 pack carburetors. The engine produced 434hp/514 ft lb on the dyno and has no problem smoking the tires. 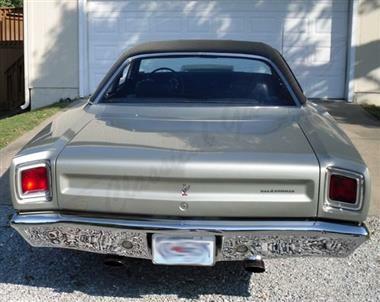 A big portion of the restoration cost when into the motor because it was done right. It features KB pistons, Manley Rods, hydraulic roller lifters, a hydraulic cam, ARP studs, and Edelbrock heads. 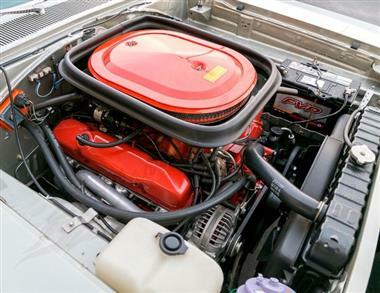 The engine compartment was painted to match the body and a majority of the engine components painted in the factory style Mopar Orange color. Backing up the motor is a 4 speed manual transmission that sure makes this car fun to drive. It transfers power back to the Dana 60 posi rear end with 4.10:1 gears. The front suspension is independent and it has leaf springs in rear. Power brakes have been added with disc up front and drum in rear. The entire undercarriage of the car has been painted and detailed out very nicely. It was built to be driven but you can tell by the undercarriage a lot of detail work went into making it show ready as well. The interior has entirely been redone and features all Black upholstery. The split bench seat is comfortable and shows little to no signs of wear and tear. The Hurst shifter is routed through the floor with a chrome handle and wood knob. Everything has been kept looking mostly stock with the original style gauges and dash set up but a Sun column mounted tachometer was added as well as underdash gauges for oil/water. The AM radio works well and is sitting in its original location. The trunk was not ignored through the process either because it was all repainted and has the correct style fitted trunk mat. 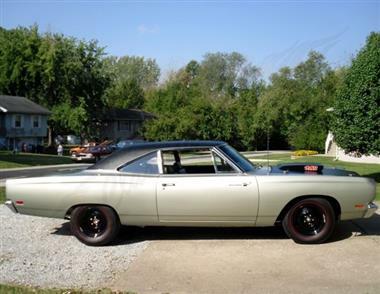 This is a nice Mopar that performs well at shows and is sure to put a smile on your face while your driving to them. Check it out while its still available! Add it to your collection for $57,500.00! NOW REDUCED DOWN TO $51,500.00! 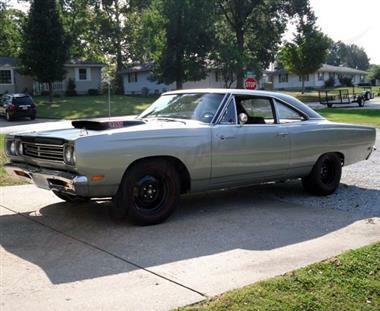 Price Analysis for 1969 PLYMOUTH Road Runner. 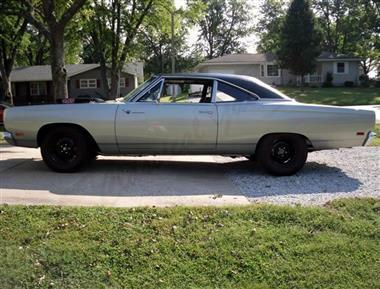 This vehicle is priced $3,015 more than the Average Market Price of $48,485 for a 1969 PLYMOUTH Road Runner. This is a Fair Deal as it's priced 6.0 % above market avg. The Pie chart below shows the number of ads within different price ranges.